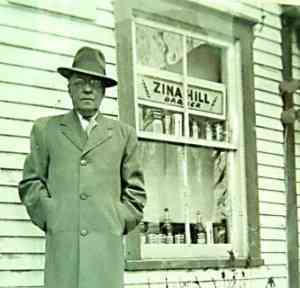 Zina Hill in front of his shop at Moulinette. Welcome to the Zina (pronounced Zinee) Hill Barbershop from the lost village of Moulinette. This original building was purchased by Harold Fickes, former deputy-reeve for the Township of Cornwall, at the time of the Seaway and Hydro Project, for the amount of ten dollars, and was moved to his farm north of Moulinette on the Second Concession. Unless you saw this building before it was moved, it’s hard to believe that Mr. Fickes used the building first as a chicken coop and then as a storage shed for his farm hand-tools. 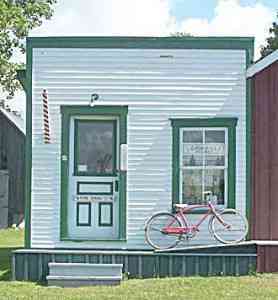 The building was then passed on to Bob and Sherry Lyons, who donated it in 1997 to the Lost Villages Historical Society. Barbershop now at the museum. After being moved to the museum site, the building was restored by volunteers from the Lost Villages Historical Society. They were able to recreate the look of Mr. Hill’s barbershop as it would have looked when he had to walk away from his business in Moulinette. 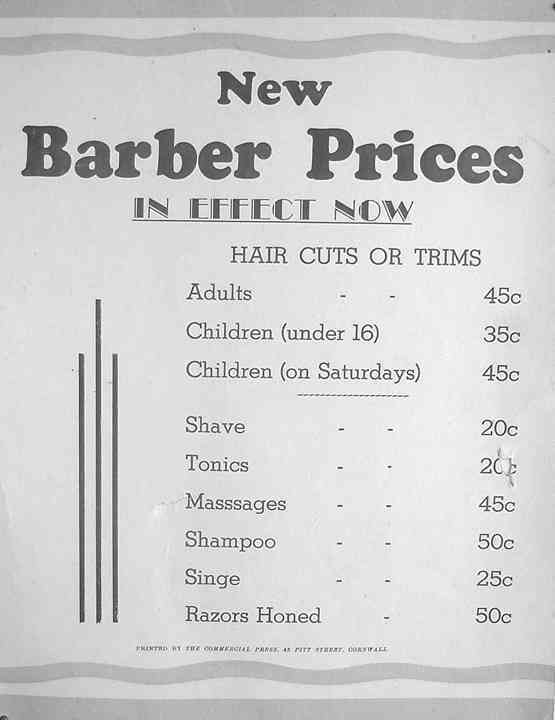 The tiled floor is representative of the floor which would have existed in his barber shop in the 1950s. These tiles were provided by Laura and Harold Snetsinger, formerly of Dickinson’s Landing. They were the remaining tiles that they had used in their new house in Ingleside. The original packaging slip was also given and indicates that the tiles were packed in Glasgow, Scotland, in 1956.The decor has been kept as accurate as possible. 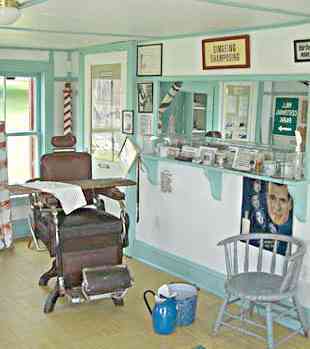 Mr.Hill’s “one-and-only” barber’s chair stands in the shop, as well as a replica of his illuminated sign and his barber’s pole. They were generously donated by the Hill family. 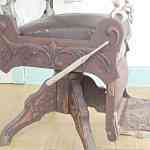 The captain’s chairs are from Henry Laflamme’s barber’s shop in Wales. Legend has it that they were made in the lost village of Farran’s Point. 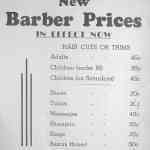 The second barber pole also came from Mr. Laflamme’s, as did the large display case. A photograph of Mr. Laflamme hangs in the barber display and shows him cutting the hair of Brent Ransom, a sixth generation member of the Ransom family. The smaller display case came from Mr.Hill’s barber’s shop. Mr.Hill’s tools of the trade are also on display. His left-handed scissors, which were used by his daughter-in-law, Dorothy (Ashie) Hill, as she cut the ribbon to open the barber shop on July 1, 1997, and his harmonica, which he used to serenade his customers from time to time. 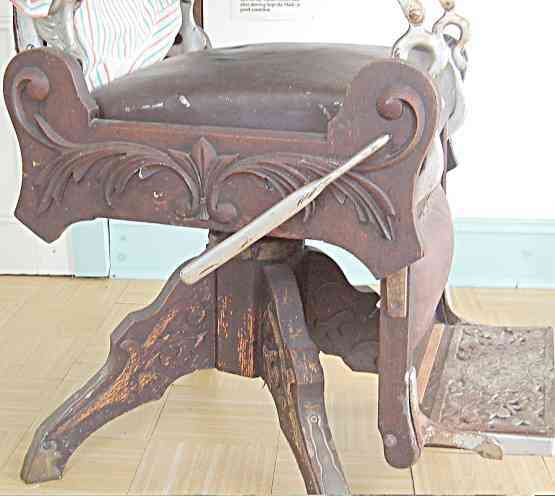 A third barber’s pole came from the Manson McConnell barber’s shop which was originally located in Aultsville. Dorothy (Ashie) Hill at the barbershop in Moulinette. 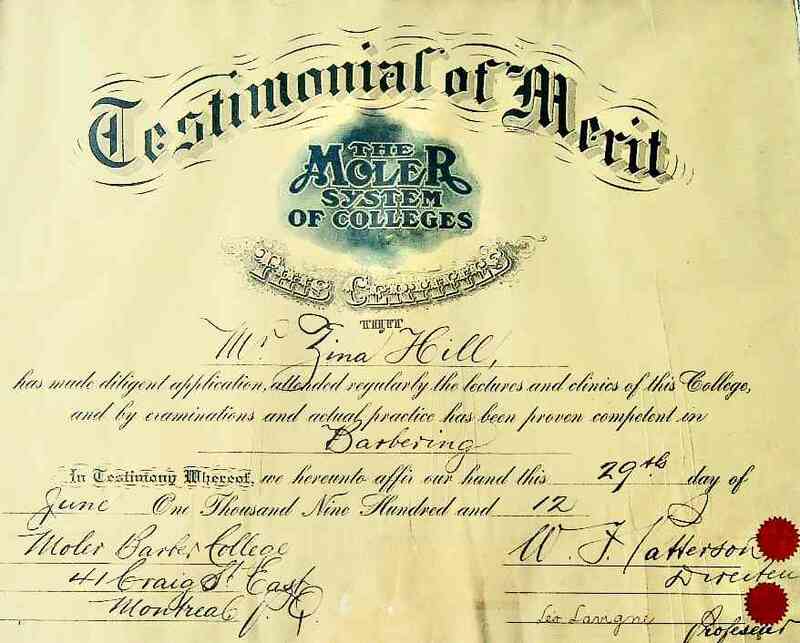 Besides being a professional barber, Mr.Hill was employed at the Provincial Paper Mill at Mille Roches. 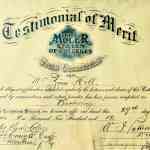 He was also an enthusiastic choir member at St.Andrews Methodist/United Church in Moulinette. 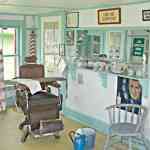 This building provides an authentic look at a barber shop from a time and place that no longer exists.